SFW123DSB Combination Fire/Water Safe is rated 4.6 out of 5 by 24. 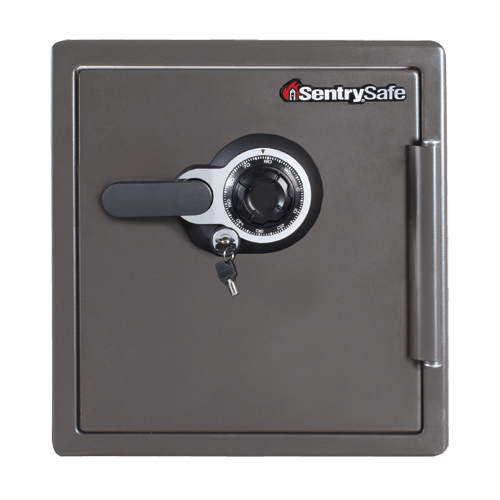 Designed to protect your important documents, digital media and other valuables from fire, water, and theft, the SentrySafe SFW123DSB is ideal for your home and office security needs. 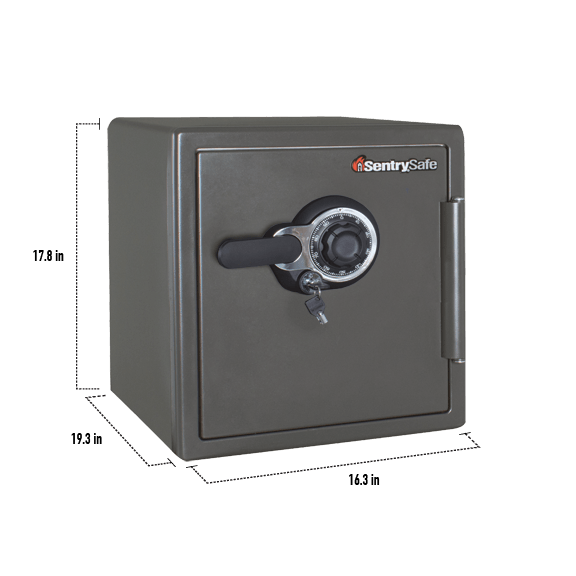 Solid steel construction paired with a dual locking system helps provide additional protection for unwanted access. Rated 3 out of 5 by Disheartened1 from One major flaw. This would be an excellent safe if not for the fact it has a really cheaply made plastic handle. Sentry should project quality. The handle should be made of the highest quality material. In a fire the handle would be gone in an instant. What good is a safe if it can't be simply opened after a fire? Rated 4 out of 5 by jfitz from arrived with a dent in the side I believe the damage occured during shipment. It appears to be cosmetic and not functional so we didn't bother exchanging it. Other than the fact that it arrived damaged, I think it's a great safe. It's heavy and strong. I like that it requires both a key and combination to open. Rated 4 out of 5 by DonnaJim83 from Strong and safe I reviewed several safes and glad I picked this one, I’m not great at combinations but tried a few times before I put my valuables in, I feel confident that my things are safe in this, it’s exactly how stayed and arrived very fast, thank you from an older person! Rated 5 out of 5 by southern comfort from STRONG, MADE WELL. FIRE AND WATER PROTECTION Think this safe is very sturdy. Very happy with it. Just the right size. There is just one thing: THE ARROW ON TOP SHOULD BE RED IN COLOR. Would make it much easier to accurately dial the combination. I have to use a flashlight to open it. Rated 4 out of 5 by PRRZ from Set up was easy I just received it yesterday, so I can't evaluate it fully, yet. It works as expected so far, though closing it is tricky and takes a lot of pressure. I plan to review again in about 6 months, after using it normally. Rated 5 out of 5 by Ron43 from Perfect for my home needs This safe has plenty of room for the essential documents and valuable I want to protect. It does not take up a lot of room. At 80+ pounds, you should have help lifting it into the place you locate it. 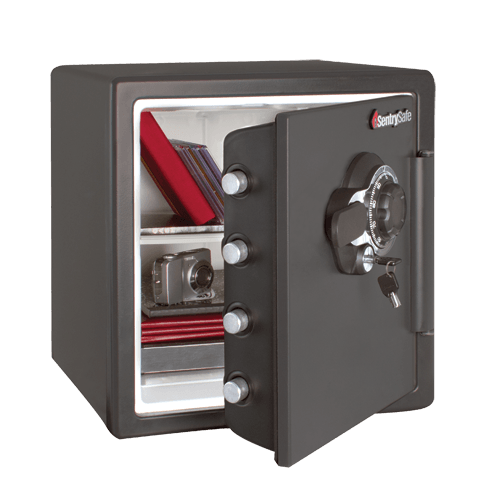 Rated 5 out of 5 by Leslie65 from A good investment These safes are well made and priced right. I hope I never have to see if it is truely Fire/Water safe, but will continue to purchase this brand of safes for my important documents and items. 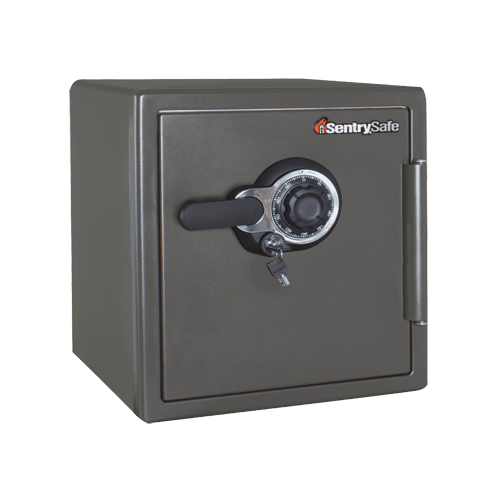 Rated 5 out of 5 by Dianne48 from Strong & Dependable Safe This safe is the perfect safe for my needs. I wanted to secure my jewelry, important documents & passports, plus more. Everything I wanted to keep safe fit easily.